1. In a large bowl toss together cauliflower, 1 tablespoon sesame oil, 1 minced garlic clove, and 1 teaspoon minced ginger. Lightly season with salt and pepper. Set aside. 2. In a sauté pan, whisk together remaining garlic, ginger, sesame oil, mirin, hoisin, oyster sauce, soy sauce, honey, sambal, white pepper, and 2 tablespoons water. 3. Simmer sauce over medium-low heat until slightly thickened. Remove from heat and keep warm. 4. Place a wok or tall pot over medium-high heat and add about 3 inches oil. Heat oil to 350˚F. 6. Again, working in small batches, carefully fry florets for 3 to 4 minutes or until the florets have a crispy coated exterior and tender interior. 7. Transfer fried cauliflower to a cooling rack sitting atop a baking sheet. Repeat steps 6 and 7 until all florets have been fried. 8. While the last batch of florets fry, place sauce back over the stove and simmer over medium-low heat. 9. Add fried cauliflower to sauce and quickly but carefully toss together until all cauliflower is fully and evenly coated. 10. 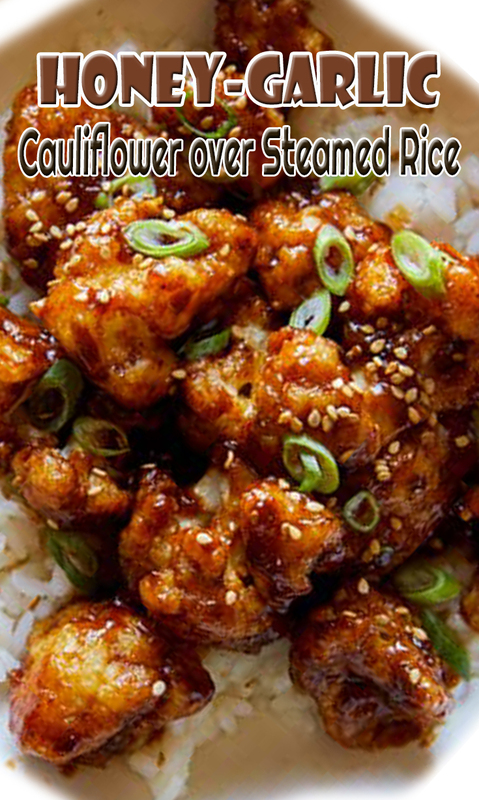 Scoop cauliflower over plates of steamed rice and top with a sprinkle of sesame seeds and sliced green onion. Serve immediately.